I'm everyone's least favorite person to draw for Secret Santa. For years, I told my family to forgo buying anything other than gift certificates for me. I'm just the worst about what I like and what I don't. And nothing is worse than getting something you know the giver tried hard to get right. So, in the spirit of the holiday season, if you have someone like me on your list, here are some ideas. THING EXPLAINER by Randall Munroe. I love love love this book. It explains complicated stuff (how does an elevator work, how does a plane fly, how do pens work!) which is always interesting BUT il it explains all this stuff in "simple words" ie the most common thousand words, or really the most common "ten hundred" words. You can read this book with little kids, or give it to big kids because even though the language is simple, it's not patronizing or talking down to the reader. It would also be perfect for anyone for whom English is a second (or third!) language and is still on some of the basics. 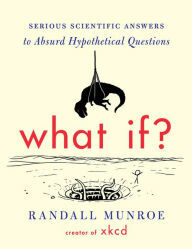 Also by this author: WHAT IF: serious scientific answers to absurd hypothetical questions which is perfect for your conspiracy minded uncle, or everyone you know in 4th grade. Ha, not only am I buying both for that certain person in my life impossible to buy for, I'm getting each for me. Merry Christmas me. All four of my boys need that Thing Explainer book. How cool is that? Ah, the power of the QOTKU. Thanks for the tips! It's getting down to the wire. I always get nervous when the Amazon banner says "X days left to order for Christmas." (Prime member two day shipping) This is when I start ticking off in my head who I bought for and did I miss anyone??? Well that takes care of my nephew! Thanks QOTKU. Heartily recommend. I've been an avid reader of xkcd since pretty much it began. "What If?" is pure awesomeness. Did any of you read his cartoons? Kites. Laughed. Out. Loud! I have a sister in law who is impossible to buy for. I'd consider either of these, but I bought her a Nook Glow Light reader last year and she still hasn't used it. This year, she's getting gift cards because I am officially at a loss. Would interesting to know what the one day spike is on these titles. And what the daily hits on this blog are. One for my thirteen yo daughter, one for my dad. 'What If' sounds perfect for my wee boy. Thanks for that! Going on my TBR list, but I'm also making a note for my nephew's birthday in the spring. I already bought him and my niece a bunch of books for Christmas! These both look amazing. Hubby would love them if I can find an audio version. 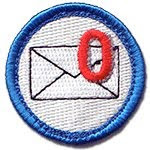 I am exceedingly good at wasting, I mean spending, money and as a result can typically think of at least one fitting thing for a person if I get them via Secret Santa. This year, unfortunately, my randomly chosen Etsy seller has apparently decided not to deliver. So we'll see how that goes. I have one couple and one relation to buy for, and alas NONE of them are readers. Ever. So, gift certificate for a massage for the relation, and ... I dunno, something cooking related for the couple. I think if I gave any of these people a book they'd peer at me in confusion. I'm surprised scotch isn't on your list. If I drew you for Secret Santa, you'd end up with a decent single malt. Somewhere above a Drumguish or Speyburn, but not as high as a Macallan 18. Or if there was a price cap, I'd opt for a small sample set; I ended up with a Balvenie sample set at a "dirty Santa" gift exchange last year - good stuff. @SiSi, you have got to be her favorite aunt ever. SP: On Amazon.ca, anyway, What if...? is available as an audio CD. Thing Explainer seems to have a lot of pictures and diagrams, so probably wouldn't work as well in an audio format. Margaret Mizushima's STALKING GROUND, second in the Timber Creek K-9 series, taking readers deeper into the Colorado high country where mayhem, mystery and a brush with something that looks a little like romance await a Deputy and her canine partner, to Matt Martz at Crooked Lane, in a nice deal, for publication in Fall 2016, by Terrie Wolf at AKA Literary (World). I read WHAT IF just last week! It was the best science book I've read since THE PHYSICS OF SUPERHEROES. 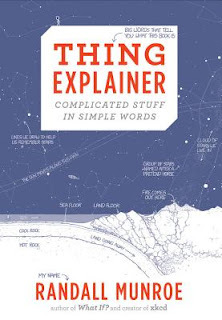 I'm still waiting for THING EXPLAINER from the library. Colin, while WHAT IF doesn't explore what would happen if the Earth had multiple rotational axes, it DOES happen to explain what would happen if the Earth's rotation came to a sudden halt! Ha, great ideas. I love giving books for gifts. This is the book I am giving to a few friends. I'm making rope bowls for a few select friends and putting treats in them. They are made from used catch ropes. I do wash them in the washer before I make them. I'm not a total heathen. I need to get hold of Kari Lynn. I'm running out of ropes. That's another benefit of living in Texas, everyone and their grandmother ropes. The feedstore I used to use had thousands of used ropes. It was like a mountain of ropes. Walking into the store and being assaulted with the smell of leather new and old and then back to the rope pen was heaven. I'm dry brush painting ceramics for a few people. My Christmas shopping is pretty much done. The handmade stuff is just for special people. Great idea for gifts. My son is an engineer. This is perfect. Thank you for the suggestion. If I ordered them today it would be three or four days until they get here. Then I would get hung up and wonder why those who buy for me miss the mark so badly. Then these two books would end up staying in my possession. By next year they would be dog eared and marked up as research for either a speculative thriller or the sci-fi down the block. I am the hardest person to buy for anywhere, according to my better half. Thanks for the suggestions, Janet. I love books like these. I'm putting them on my list to give to my husband. He has the hardest time buying things for me that I like. We learned a long time ago, the best solution was for me to give him a list. OT: MIA these past few days, hubby and I hosted our annual Christmas party/sit-down dinner. He took care of the 5 course menu; I did the tree, the decorations, table setting, making holiday cookies, etc. We said we're getting too old for this, but when our guests were still having a good time at 3-4 a.m., we knew the party was a huge success once again. Yesterday we finished getting the apartment back to holiday normal. Last night in bed hubby said, "I think next year I'll make a..." and I said, "I think next time I'll decorate the..."
How quickly we forget all the work involved when we can share special moments with friends. Thanks for the ideas! I was looking for something for my dad, and What If... sounds right up his alley. I just hope my local bookstore has it because it's too late for an Amazon order to get to NZ unless I mortgage my house for express shipping. Kate, have you tried BookDepository.com? I think it's 8-10 days shipping to NZ from UK...and FREE!!! WHAT IF was a Christmas present for my husband last year and he couldn't put it down. (He is a geek and xkcd fan, but still). It has a lot of quirky humor. Didn't know there was another one by him... might have to get husband the other this year! My brother just emailed me asking what I want for Christmas. So I'm heading back to Janet Reid's list of best books read in 2015 to pick more books than the four I selected originally; and will send a longer list to him to buy for his favorite brother (his only brother, which makes the competition easier). OMG, my daughter would love both of those! Don't your secret santas just buy you Scotch? DH just had a secret santa thing with his law school small group, and he hates this kind of thing. He ended up making candied almonds and buying a bottle of wine. Of course, there was the time we brought wine, chocolate, and fancy German smoked ham to people who were 7th day Adventist, and didn't smoke or drink (he had NO idea his cousins were 7th day Adventist, not common in the Netherlands, and they'd converted since his last visit). Also, apparently Belgian chocolate is better than Swiss chocolate. But other than that, consumables have worked well for us. If I'm bringing a gift I usually know if someone is kosher, gluten-free, or a teetotaler. Those books sound perfect for one of my sons. He comes up with some pretty cool What If? scenarios and would get a kick out of that one for sure. 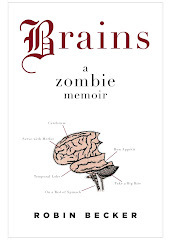 And with (according to him) the zombie apocalypse fast approaching, I'm sure he could use a book that explains how thing work so he can help rebuild civilization. Maybe that's something the SIL would finally appreciate. No. On second thought, probably not. All I want for Christmas is another dinosaur egg. I put my one under the tree each year hoping Santa will take the hint, but, alas, he does not. I think if I had two mine would hatch. It's just lonely. So, there under the tree is the dinosaur egg and three angels standing watch over it. It's a typical Weathers Christmas.